Made for newborn babies 3-6 kg. Extra soft surface material and pliable fit and leakage barriers and waist elastic to prevent anything from leaking onto the baby's stomach and back. Specially shaped to release pressure from the delicate belly button of the new born babies. Ideal for babies laying down on their back but also when they are starting to roll. The change indicator transforms from yellow to blue when it’s time to change the nappy. This helps to keep the baby's skin soft and dry. Libero has a soft, breathable non-woven outer material that allows air to circulate, keeping the baby’s delicate skin dry and comfortable, and minimising irritation. 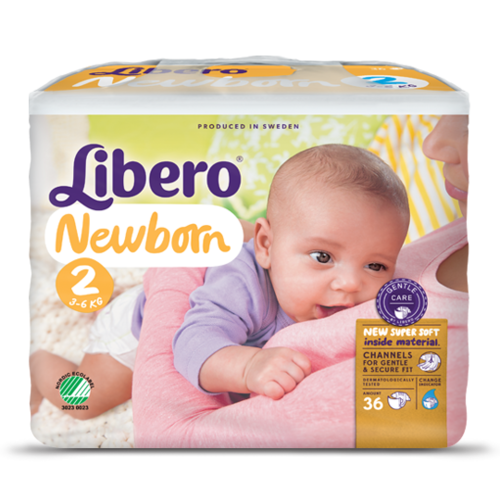 Libero nappies are made from soft material, gentle against the baby’s skin. Elastics around the legs provide a great fit. The thin and pliable core enables a close fit between the legs. Whether the baby is sitting-up or lying down, standing or walking, the nappy easily adapts to his or her movements. Libero nappies are made from soft material, gentle against the baby’s skin. Elastics around the waist provide a perfect fit and prevent leakages. Whether the baby is sitting-up or lying down, standing or walking, the nappy easily adapts to his or her movements and stays in place. All Libero nappies have a super-absorbent core that provides up to 12 hours of dryness. This high absorption capacity, combined with the nappy’s effective leakage barriers, keep the baby’s skin feeling dry. We are very proud to have been approved by Nordic Swan Ecolable, the Nordic countries’ official eco label. In order to get the approval high health and environmental demands need to be met. The product’s quality and function are also part of the evaluation. 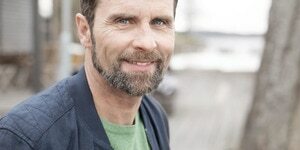 The Nordic Swan examines the environmental impact during the most important parts of a nappies life cycle. At SCA we work with all parts of a Libero nappy life cycle, for instance in our choice of material suppliers, how we produce the nappies and the choice of materials. Libero nappies have hook-fastening tabs that are secured to the front of the nappy, which can be opened and closed as many times as necessary to achieve the perfect fit. Whether the baby is sitting or standing, the elastic waistband and the hook-fastening adapt to fit the baby’s movements. The yellow stripe of change indicator on the outer surface, changes color when the diaper is wet. It supports in knowing when it’s time to change diaper. This helps to keep the babies skin soft and dry. The diaper is designed to leave some space in the waist area to give room and release pressure from the delicate belly button.